A decal printed for the 12th National Convention of American War Mothers. The American War Mothers is a national organization chartered by Congress with its headquarters in Washington, DC. Its members are mothers whose sons and daughters have served or who are serving in the Armed Forces. Its objective is to aid the serviceman or veteran and his family, including those who are hospitalized. This decal is gilded and in the shape of a school bus, with red and blue accents. Measures 3 ½” x 2”. 700 pages, (plus fascinating ads of books) with twenty-six black and white illustrations. The title page states: "a complete history of metropolitan life and society, with sketches of prominent places, persons and things in the city, as they actually exist." With over ninety chapters, almost every subject is covered, such as 'Fifth Avenue', 'The Restaurants', 'Cornelius Vanderbilt', 'The Thieves', 'Children and Society', 'The Beggars', and 'Street Railways'. The illustrations either showcase locations in New York, or portraits such as 'Street Arabs' or 'Street Beggars'. The author, Junius Henri Brown, was a famous Civil War correspondent for the New York Tribune and New York Times. Brown linen covers over boards, measures 9" x 5 3/4"
. Covers show moderate edge wear, with general soiling and staining due to age. The binding is cracked, and there is a tear in the linen cover on the front in the bottom left corner. The interior pages are moderately toned and soiled, with some water stains on the right edge of the page, these stains due not impact readability, or visually impact any of the illustrations. Overall, good condition. 16pp. 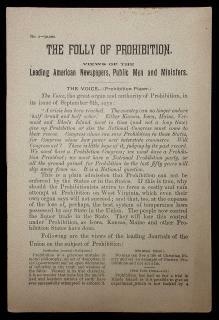 An attempt to rebuke the idea of prohibition through the use of quotes that support the ineffectiveness of it. Starting with a passage from "The Voice" which was the prohibition newspaper, the argument against prohibition, and the inability to enforce it, is briefly commented on. Then pulled quotes from various sources are used, divided into three categories. There are quotes of various length pulled from newspaper articles like the New York Times, Boston Globe, Providence Journal and Omaha Herald. Then are quotes from prominent men, with some historical figures, like Thomas Jefferson, Abraham Lincoln. Also included is Bodwell, governor of Maine,Senator Richard Coke, and Herbert Spencer. The third category is leading ministers that dismiss the religious impetus for prohibition, with quotes from Francis Murphy, Rev. H.P. Collins and discussion from the Episcopal Conference. 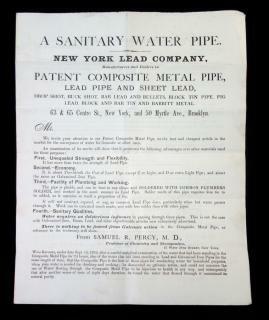 Measures 8 1/2" x 5 3/4"..
An 8 1/2" x 11" two-sided typewritten and mimeographed newsletter. Includes information on New Study Groups, Equal Rights Panel, M.O.R.A.L. Teach-In, Females and Self-Defense, Washington Conference, Street Rallies, B. U. Women's Center, and Self-Defense. This is followed by a Calendar of events for October 13-18. The group was located at 1126 Boylston, Boston. . The group was established in 1970. Song Sheet: Labour is the Source of Wealth. "The Hard Working Man"
A 10" x 7 1/4" songsheet with woodcut engravings of a skep, clasped hands, and a regal lady in a coach guarded by soldiers. Decorative devices add structure to the sheet. Verse begins "Who is the prop, the support of the land, The rich or the por I would ask..." Reverse is blank. Edge tears, small amounts of paper log. A letter from the Hall of Record, Selectmen's Office dated July 30th writing to the Selectmen of Middletown (CT) requesting they pay for the confinement of $3 per week in a Hartford hospital for an orphaned daughter, Meary Barry, of a deceased resident of Middletown. "She is in the family way by Jepee Strickland of South Glastenbury so she says" The Selectman suggests Hartford pay the bill and get reimbursed by Middletown. There was an apparent reply on August 5th, comments - see Letter book. The Selectman then replies on August 10th providing requested information on the death of Meary's parents. The parents both died in South Farms after working a farm on shares at "South Farms". Meary worked in a suspender factory and lived with various families until she "got into trouble being with child by a man who had agreed to marry her but has since cleared out". The Selectman is firm--Middletown must pay. Letter sheets measure 9 1/2" x 7 1/2"